Billie McDonald, a son of Lacy Albert McDonald and Carrie Eugenia Langford, was born November 10, 1920 at Ray City, GA. He was a grandson of William C. McDonald and Jane Lastinger McDonald. Billie and his sisters attended the Ray City School. Mabel McDonald graduated from the Ray City School (then a junior high school) with the class of 1930 and went on to graduate from Valdosta High School in 1932. Eugenia McDonald graduated from Ray City High School with the class of 1936, and Billie McDonald graduated with the RCHS class of 1938. One of Billie’s classmates at Ray City was J.I. Clements who went on to a long coaching career at Georgia Southern University. Billie McDonald’s father, Lacy A. McDonald, (1881-1960) was born at Cat Creek, Lowndes County, GA and worked in the Cat Creek District as a rural mail carrier. Lacy McDonald was probably educated at Kings Chapel School near Ray City, as was his sister, Lillie McDonald, who attended the school in 1906. Billie’s mother, Carrie Eugenia Langford (1894-1984), was born at Rays Mill, GA (now Ray City) on August 31, 1894, a daughter of William E. Langford and Mary Virginia Knight, granddaughter of William Washington Knight, and great granddaughter of Levi J. Knight, original settler of Ray City, GA. Her parents owned a place between the farms of her uncle Walter Howard Knight and cousin Paul Knight. Lacy McDonald and Carrie E. Langford were married on January 3, 1915 in Berrien County, GA. The ceremony was performed by Perry Thomas Knight, Minister of God. Afterward, they made their home at Ray City, on the farm of Carrie’s parents. Lacy continued to work as a rural mail carrier. His 1918 draft registration gives his physical description as short and slender with brown eyes and dark hair. In the summer of 1931, ten-year-old Billie McDonald, his sister Mabel and their mother all went to Camp Wilkins, the first 4-H camp in Georgia. Camp Wilkins was a program at the Georgia State College of Agriculture and the Mechanical Arts at Athens, GA, now known as the University of Georgia. Billie and Mabel were there for the summer-long boys’ and girls camps. Their mother, Carrie McDonald, was there for a week long session for Farm Women. Also attending from Ray City that summer at Camp Wilkins were Leland Langford (RCHS, 1939), J. D. Luke, James Swindle (RCHS, 1936), and girls Clyde Carter (RCHS 1936), Margaret Carter, Clyde Moore, Doris Swindle, and Grace Swindle. Chloe Johnson was there also, attending the summer school for farm women. The 4-H activities in Berrien County were coordinated by County Agricultural Agent Donald L. Branyon. 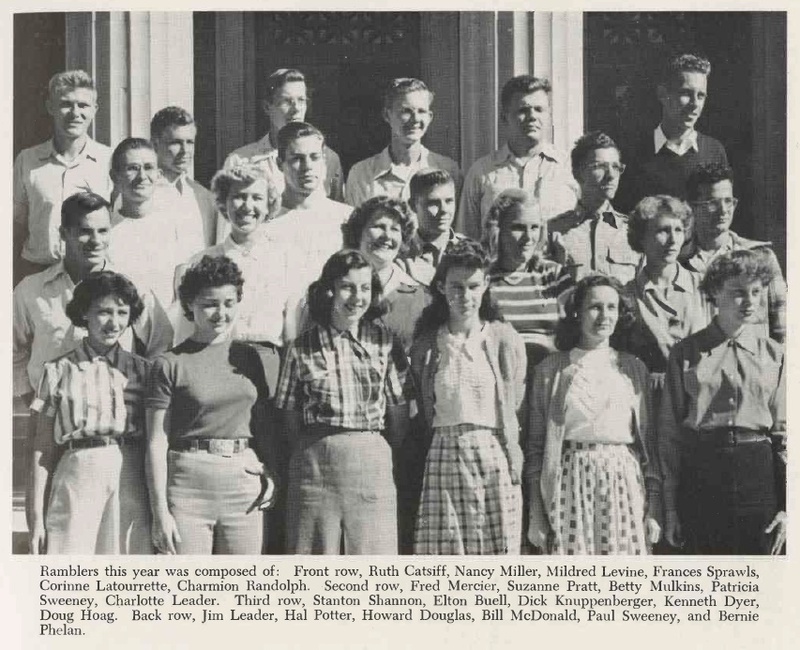 Billie Graduated with the RCHS class of 1938. In 1950, he was enrolled at the University of Arizona. While pursuing his degree there he was a member of the Ramblers hiking club. 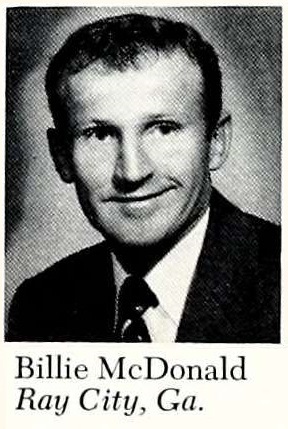 Billie McDonald, of Ray City, GA, attended the University of Arizona in 1950. Billie was a member of the Ramblers hiking club. The only prerequisite for membership in Ramblers, Arizona’s hiking club, is an incurable wanderlust. Ramblers departed regularly each Sunday for many points of interest in the Southwest, including Miller Peak, Mt. Lemmon, and Baboquivari Peak. The Rambler pin identifies those who have tramped on a required number of hikes. Billie McDonald married Lucile “Lucy” Ponsell (Lucy) McDonald (1921-2008). She was born near Waycross GA and lived in Jacksonville, FL during her early life. She also lived in Arizona, Alabama, Missouri and Mississippi before settling in Ray City, GA. She was a volunteer at the Ray City library. She was a member of the First Baptist Church in Ray City where she also worked in the church library.